Was one of your resolutions this year to become healthier? Do you smoke? A lot of my friends do, throughout high school, university, post-grad, and even now. The sad thing is many of them want to quit. One of my best friends in high school tried multiple times to quit cold turkey. He failed every time. Another one of my friends has been trying for 6 years to quit now. His last attempt was cold turkey over lent this year. Last I saw him, he was pretty much still a chain smoker. Well, maybe not that bad but he would have to leave in the middle of dinner to get his fix. I recently have been pitched multiple times for ecigarettes. Honestly, I was like, "What?!" I don't smoke. I know people who do but I didn't really give it a second thought. Then I got curious and looked up ecigarette reviews. 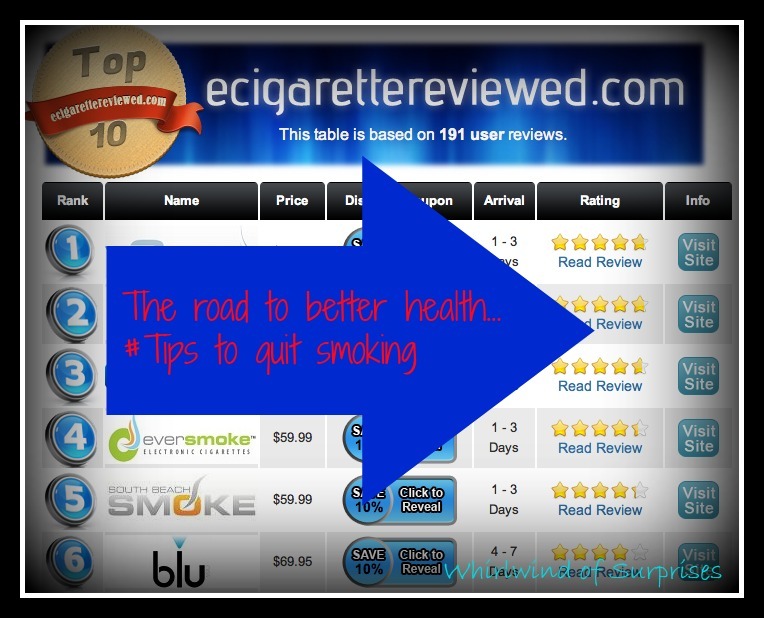 Surprisingly, I found a comprehensive site that offered unbiased reviews of the leading electronic cigarette brands by ecigarettereviewed.com staff. They actually inspect the companies reviewed to make sure they're offering reliable products to consumers. Besides that, users can comment with their own reviews so you can for sure get an unbiased review. I personally loved how there was a big chart up front that rates the leading leading electronic cigarette companies by popularity with prices too. It really breaks it down nice and easy. There's even coupon codes available. After this knowledge, I can't help but wonder if something like this had existed back in the day, it may have helped my friends quit. It still can today because ecigarettes substitute water vapor with nicotine in it to help smokers get over withdrawals, without exposing them to tobacco. Better for the ones quitting and those around them because there's no second hand smoke! 1) Make a plan. How committed are you to quit? Set a date and commit to it. 2) Make a list of reasons why you want to quit. Use it as encouragement and a reminder. 3) Quit slowly, cold turkey rarely works. If you need it, use aids like e-cigarettes, nicotine patches. 4) Talk through it with others, have a support group ready be it family or actual support groups. They exist and they can help. 5) Try not to hang around with those who are still smoking, at least until you've quit. Temptation doesn't help. 6) It's a process. People relapse all the time but may find that the time in between grows longer each time. Keep trying! Did I miss anything? Let me know below.